This is a common sight in San Miguel. Gangs returning home with Stuff. Looks like they forgot to gather up the pigeon. Am not sure if they also bought that baby and baby carrier. In Ontario, Canada we are now charged 5¢ for each bag we need in order to reduce the amount of plastic bags in circulation. Now everyone carries a bag just like San Miguel. But isn’t the solution not the bag but what is in the bag. The expression Shop until you Drop is rather strange. How can buying be that much fun? Compulsive shopping can temporarily mask a sense of worthlessness. This turns shopping into an emotional problem, indicating a poor sense of self that may require attention from a psychologist. We all buy things for ourselves on occasion; it becomes an issue if we do it regularly and to prop ourselves up. Compulsive Behaviors are the mainstay of Gangs be they shopping, art collecting, doing good works, rescuing dogs or meeting each day in the Jardin. It is all about purpose and of course filling the hours of retirement. Given a problem and a love of the earth, Good Works Gang has come up with a program to help reduce our Carbon Footprint and help people with the Compulsive Shopping Disorder (CSD) – a Double Good Works (DGW). The Bag Police wander the Jardin to help people who have been shopping compulsively. When it looks like your Freda Kahlo bag is not full of Organic produce, and/or they suspect CSC, they will stop you and look through your bags..
might not stop the shopping but it does cause people to pause and consider the environment. Mexicans artesanos have a knack for making art out of unusual materials – corn husks, reeds, onyx, and fabric are among the many, many media used to create unique art. And the subject matter can be local or mystical or just for the tourists. It all started with the Mojigangas. This was the first time Expats images appeared as Folk Art. But soon more Expat Folk Art began to appear in Local Mexican Markets in Gringo Free Areas. Mexicans just love to collect these new art forms. One of the most popular is the Tiffany Lamp Lady. Mexican children love to turn on and turn off the Expat Lady and laugh as she lights up and goes dark much like the Expat Ladies in the Jardin. This is a new movement in SMA and only a few images have been translated into Folk Art but the glow you can see in Gringo Free Zones from the Expat Lamp is growing stronger. The Personalized Day of the Dead Expat Statues are giving to each Facelift patient in San Miguel. Gangs tread a careful path between good works and bad works. Some gangs are philanthropic. Some are downright mean. It is often hard to tell the difference between shoplifting and shopping. 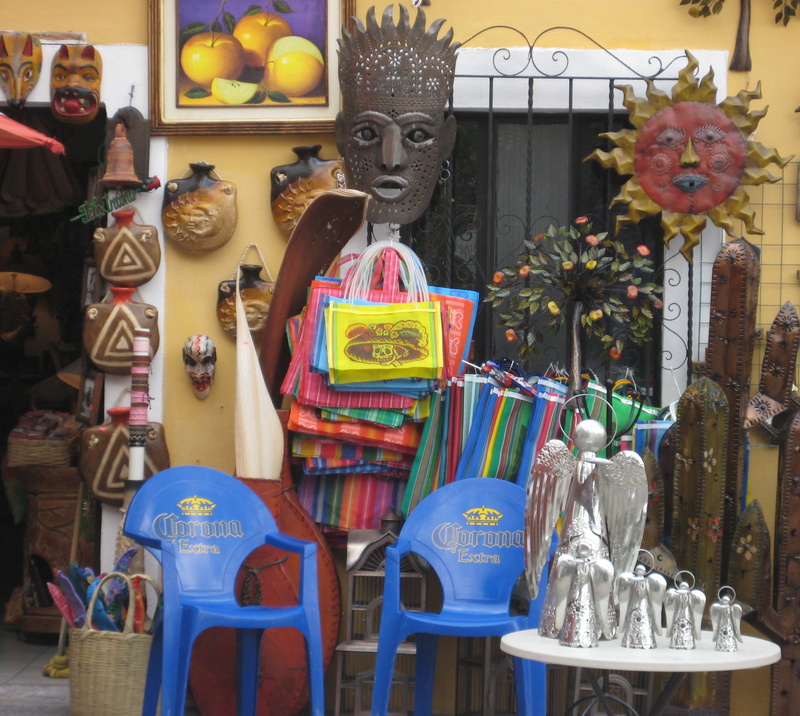 ”Tell me where you got this?” Everyone who has been in San Miguel for more than one day will have a recommendation of where to find something “Fabulous”. But when you hear people’s voices drop and say the words “Fabrica Aurora” then you have found someone who is a “True Patron of the Arts”. These are the holy people of San Miguel. No one goes out without a bag in case they find some art. 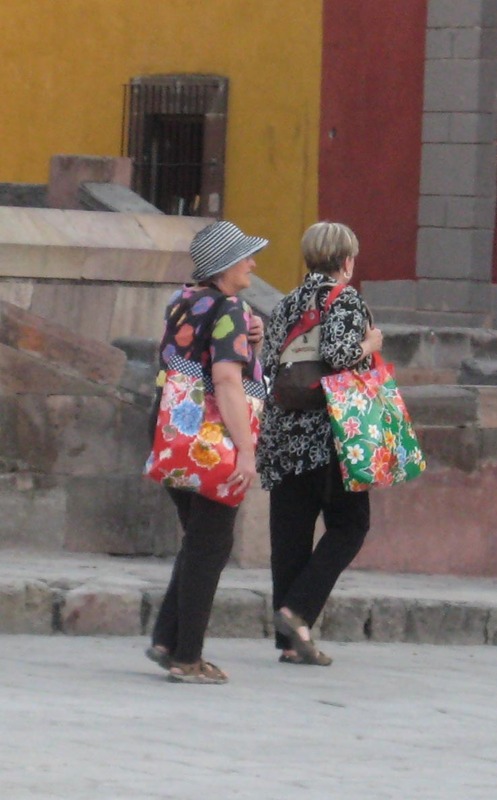 So Bags are sold everywhere in San MIguel.